Have you heard of zucchini blossoms, the edible, bright orange flower of the zucchini plant? If you have your own garden you will be all too familiar with these dainty flowers. On the other hand, you might not know how to incorporate them into recipes. This light and delicate-tasting zucchini blossom frittata is a great recipe to highlight the flavour and texture of these beautiful, edible flowers. Zucchini blossoms are a summer farmer’s market find! You may have passed by those little airy flowers and thought that they were strategically placed there simply for decoration however they are, in fact, edible. They are often served fried (I’ve fried them and stuffed them with prosciutto and mozzarella!) but there are many different ways to enjoy the delicate flavor and beautiful color of this hidden gem in your garden! One of these ways is simply sauteed or mixed into a light and healthy summer frittata. 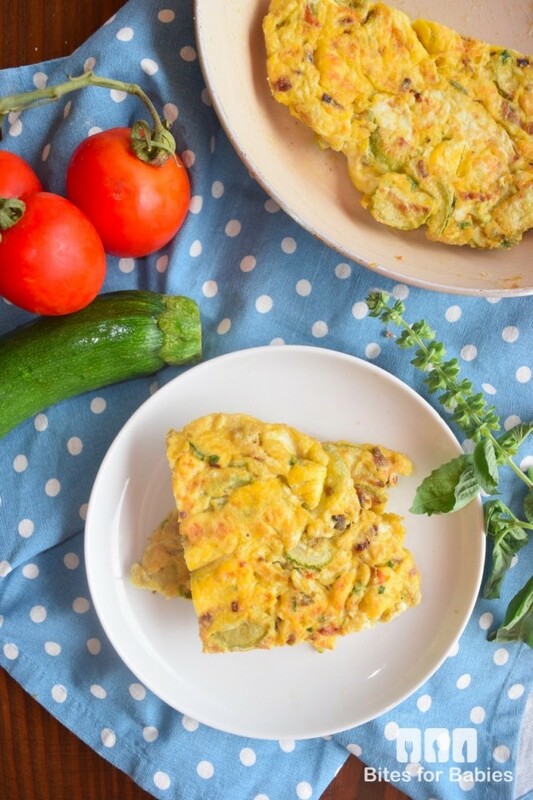 This healthy frittata is a perfect way to showcase those leftover zucchini and zucchini blossoms in your summer garden and can be served for breakfast, lunch, or dinner. 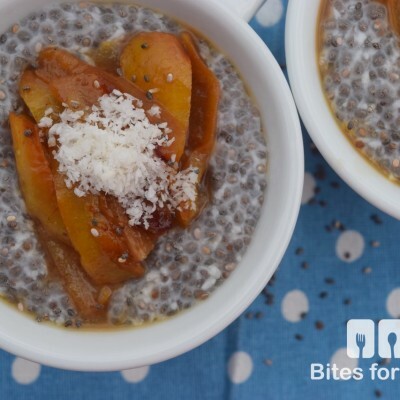 It’s an easy to make packed lunch option and not to mention, easy to eat for toddlers! I’ve packed this light and fluffy frittata between two pieces of fresh bread for a hearty lunch during the work week. Heat the oil in a medium pan on medium heat for 1-2 minutes. Finely slice the onion then add to the pan and saute for 4-5 minutes or until translucent. In the meantime, remove the stems from the zucchini, slice in half lengthwise, then chop each portion into thin slices. Add to the pan and saute for 5-7 minutes or until translucent. Add the eggs to the pan and cook for 3-4 minutes until loosely scrambled. (I simply scramble them right in the pan!). Remove the eggs from the pan and set aside in a medium bowl. Return the frying pan to the burner and add another 1-2 tbs. of olive oil. Increase the temperature to medium-high and heat the oil for 1 minute. Return the eggs to the pan and form a patty with your spatula, pressing down to ensure the frittata is uniform. Cook for about 2 minutes then cover the frying pan with a large flat plate. Hold the handle of the frying pan and press down on the center of the plate with the palm of your other hand and flip the frittata onto the plate. Slide back into the frying pan and cook for another 2 minutes on the other side. Serve warmed or at room temperature with a fresh tomato side salad. Store in the fridge in an air tight container for up to 3 days. I’ve never heard of zucchini blossoms before…I didn’t even know that a flower was associated with the zucchini. And, I’ve never come across them at the farmer’s market. Now I will be on the lookout. I have never tried anything like that before, but it’s now on my to-do list. Thanks for sharing the recipe! Great! I hope you love it as much as we do! This looks very tasty. Thank you for sharing. These look delicious. I wonder if my kiddos would like these. I bet they would, I will have to try them! I think kids would like them…at least more than zucchini itself, lol! I mean, eat a flower?! How cool would they think that is! Oh wow, that looks so good! 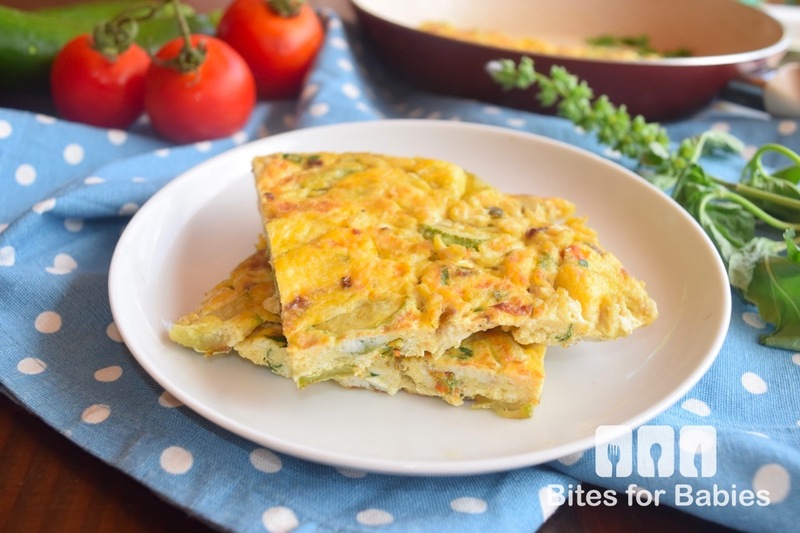 I love frittata, but haven’t had one in forever! I make them at least once a week! They are so easy to make and keep well in the fridge! I love zucchini, but this is the first time that I’ve heard of zucchini blossoms. I love frittata too, but haven’t tried the zucchini frittata yet. Bet it’s delish. I can’t wait to try it. You HAVE to try them fried…they are delicious! Thanks for this recipe. Just in time for a house party! Great! Did you end up making this? I love when my zuchinni comes in from teh garden. I’ll have to try this with what I have already frozen. It has such a different flavour right from the garden! First time I have come across a fritata recipe with zucchini blossoms. Now I am curious about the taste. I must try this! They have a very mild flavour…but the texture is great! I had no idea that you could even eat zucchini flowers. This looks good but I’m not so sure that I would like it. Lol, most people don’t! If you like zucchini you will like zucchini flowers! Great! I’d love some feedback on the recipe! I love zuccini but I never know what to make with them. Now I do! Thanks for sharing your recipe with us. I love sauteeing them with some red onions, capers, and fresh tomatoes! Ooo, that’s a great idea! Fast too! And that way they don’t get too soggy. I don’t like the soggy over cooked texture of zuccini. Yes! I sometimes chop up the zucchini and store it in the freezer for a later date. This is really cool! I think this would make a delicious meal for us. Frittata is always fun to make. Yes, it is…once you get the hang of it! Yum! That looks so good. I love cooking with zucchini! I will definitely be using this recipe! This reminds me of dishes when I lived in Trinidad. People would cook with the flowers all the time. Great recipe. Really? So you know the flavour and texture quite well! Zucchini is one of my favorite food ever but I’ve only ever eating the actual veggie part! I can’t wait to try this recipe out as I’m sure I’ll love it. I never knew you could eat any other part of the zucchini plant besides the melon! Very cool! I love eggs so I’d love this dish! I think eggs and zucchini are a match made in heaven, lol! I’ve never paired zucchini with an egg dish before. This looks like something that I would like to try. That looks so good! What a healthy way to start the day. I love zucchini anything! These are perfect for my no-low-carb diet! 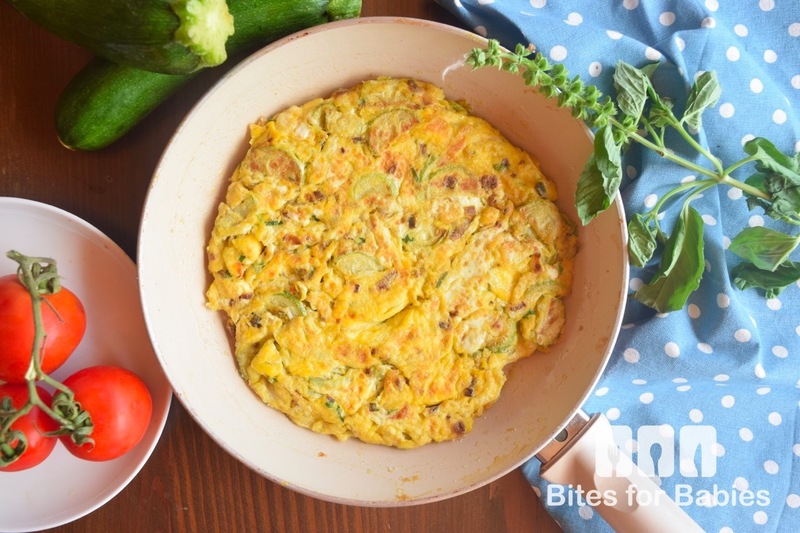 I love zucchini blossoms, but I’ve never thought of adding them to my frittata. This sounds delicious and I am definitley going to try this. How do you normally prepare them? I’ve only tried them deep fried and in a frittata. I had no idea that you could eat that flower (ok I never knew you could eat any flower LOL) I want to try this just because it’s a eatable flower and I am curious what it tastes like. There are apparently many times of edible flowers…these are the only ones I’ve tried. I’ve never had zucchini blossoms, but would really like to try them. I have a recipe for stuffed blossoms, but have never made them. Your frittata looks delicious. Maybe I need to plant some zucchini next spring. You HAVE to make the stuffed (and deep fried) ones…they are to die for! I haven’t had a frittata in ages. 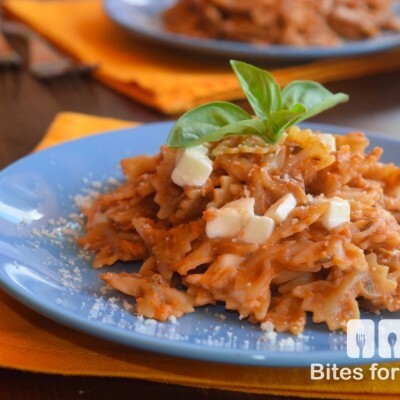 I love them and definitely want to give your recipe a try! It sounds delish! Great! I’d love some feedback if you try it! I have never thought to try the zucchini blossoms. This looks so delicious. I will have to give this recipe a try. This sounds like an interesting dish. I had no idea that you could eat zucchini flowers. Try them in a frittata or deep fried! Wow looks delicious and tasty, I’ve never tried to make this at home. I’m gonna try this and I’m sure my family would love it. Once you get the hang of it frittatas are pretty easy (and quick!) to make! Wow, I have never thought to make a fritata with zucchini blossom. I will try this for sure next time. This looks delicious! While I HAVE seen zucchini blossom before I had no idea it was edible! I love the idea of trying to use the entire plant when possible. I also have not made Frittata before although I have wanted to try to. Thank you for this recipe!